Attention all NYC businesses. The warning period is over. 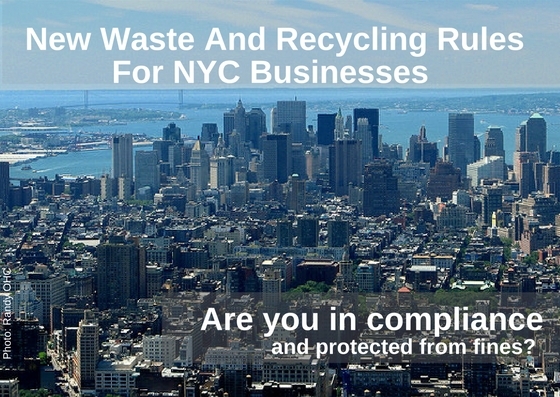 Commercial waste and recycling law enforcement is underway. Are you ready? What should you do to be in compliance and avoid fines? Read our Q&A On New Waste And Recycling Rules – What Should Businesses Do? The updated commercial/business waste and recycling law began enforcement August 1, 2017. Expect fines for non compliance. See the official notice. Enforcement began for the new organics law earlier this year. Fines are being levied. See the official notice. Click here to see resources from the city, or call your sustainability consultant or Great Forest representative to see how we can help you get in compliance. we are going to 250 West 57th street building next October and are now choosing new recycle containers for our present site . We wanted to know if we can use what we have selected for now in the future when we transfer over to the new site.